S.C. State murder suspect sought | Crime Stoppers of the Lowcountry: 554-1111 | 1-888-CRIME-SC | Anonymous tips earn cash rewards with Crime Stoppers of the Lowcountry. ORANGEBURG, SC - The South Carolina Law Enforcement Division (SLED) has identified an additional suspect wanted for the murder of a South Carolina State University student last month. 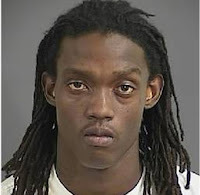 Maurice Shatodd Thompson, 23, is wanted for accessory after the fact of murder in connection with the shooting death of 22-year-old Johnathon Bailey of Holly Hill on April 15, 2011 on the campus of S.C. State. The defendants are accused of meeting Johnathon Bailey on S.C. State's campus on the night of April 15, 2011 for a pre-arranged drug transaction. After a brief discussion, Bailey tried to escape from the men, and was shot in the chest. He later died as a result of the shooting. The S.C. State Police Department is assisting SLED with the investigation. Citizens with information on Thompson's whereabouts are urged to call CRIMESTOPPERS at 1-888-CRIME-SC.